Welcome to the CTMH Spotlight Blog Hop for December! The blog hop makes a circle so if you are starting here just continue until you make your way back and you will have made it through them all. If you have already started and are coming from Wendy Kessler's blog, "My Scrapbooking Blog", then you are on the right track. When I was making this card, I wasn't really thinking about what I had made last month for this hop. If I had, I would have probably tried another "theme" other than snowflakes. However, in the past month or so, I discovered somewhere in my blog travels an idea where pearls were used to create a snowflake (I'm sorry, but I have no idea where I saw it or to whom to give credit). I was so focused in my mind on a similar idea, that I didn't think about the fact that I made a snowflake card last month. I guess, too, that maybe there's something going on subliminally. Last week a cold front came through and we were less than prepared for it. Then we got news that another, even colder, front was coming in on (last) Sunday, so I had to take the kids and myself shopping for some cold weather clothes. Don't you love unexpected expenses? I guess some who read this might think, "Unexpected? You didn't know winter was coming?" LOL Keep in mind though that I live in central Florida and we just don't get this kind of cold in December. In fact, we're usually raking leaves in January and maybe getting a few "cold snaps" in February. Anyway...the cold front is here and with the wind chill, it's expected to drop below freezing. I guess it's fair to say, another snowflake card seems appropriate...even in Florida. I decided to use this week's Mojo Monday Sketch 169 for inspiration as well. Nice touch to the snowflake - very pretty. Beautiful snowflake! 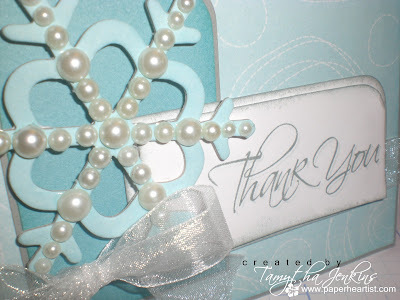 Using the different sizes of pearls added a really nice texture to the snowflake.